Patisserie Fouet takes dessert to the next level. 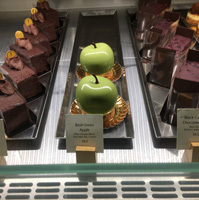 The patisserie, located near Union Square, uses innovative French techniques to create stunning pastries, like the Basil Green Apple, so life-like you will think it's real! It's made with a white chocolate mousse and green tea glaze. In the center is basil apple jelly. The apple sit on a chocolate cookie with caramel. It's luscious. The shop also serves assorted souffles, croissants, pound cakes and macarons. There's also a dessert tasting after 4pm. On the savory side, look for soups, salads and small plates of cheese and olives. Assorted coffees, teas and juices are also available.